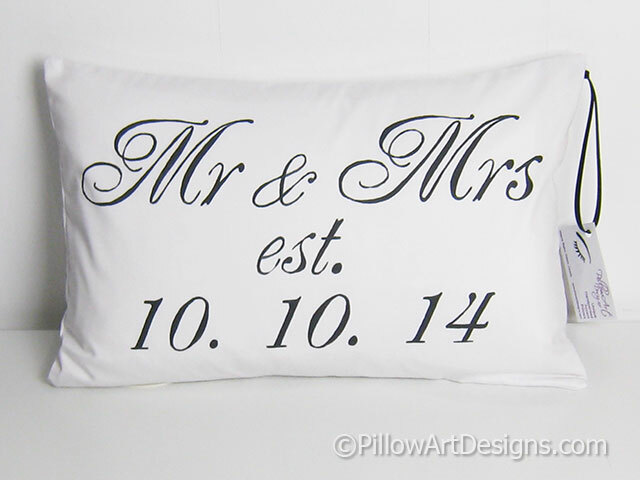 Celebrate the special date with this keepsake pillow, hand painted and handmade, painted in a classic font. 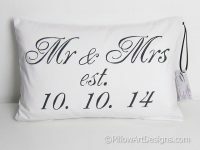 Front of pillow cover features Mr and Mrs painted above 'est' and date below in numerical format. Pillow includes down feather insert (lumbar 12 inch X 18 inch). Cover is fully lined with white cotton polyester. Size is 12 inches X 18 inches (approx). Quality non toxic fabric paint used, will not wash off, flake or rub off. Example shown painted in black. To order, simply purchase this item and remember to send me an email with the date you require for the front.